Before reviewing the Omron Pain Relief Pro, I wondered if the device would be a significant improvement on the PM3030. While that previous Omron TENS machine has a beautiful simplicity about it, I found it to be lacking in certain departments. Therefore, I decided to take a closer look at their newest TENS unit, also known as the Omron PM3031. 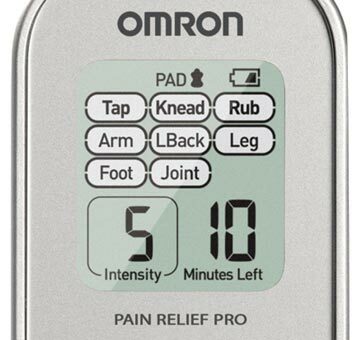 After reading this Omron Pain Relief Pro review you’ll know this machine inside-out, understand exactly what it’s good at – and be able to establish whether it can help you. There are 8 pre-set modes to choose from. 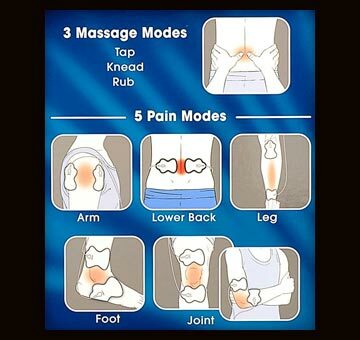 5 of these modes have been created for different areas of the body, they are labeled: Arm, LBack (Lower Back), Leg, Foot and Joint. You can actually use the modes on other areas of the body. It’s all down to what works best for you. 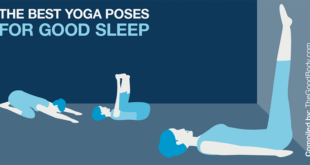 It may be that the Arm mode works well on your leg and vice versa. Omron states in their instruction manual that the programs are interchangeable. The other 3 modes at your disposal have been designed to simulate massage styles: Tap, Knead and Rub. If you’ve read my review of Omron’s PM3030 you’ll know that one of the major limitations of that device is it only has 3 pre-set modes to choose from. 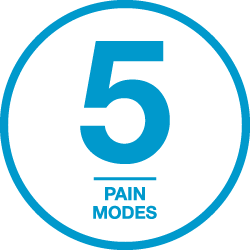 Fortunately, with the Pain Relief Pro – Omron has produced a device with more modes – and therefore, plenty of choice. 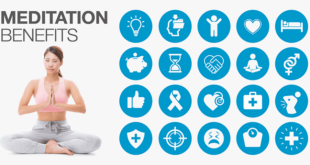 Like the other Omron TENS unit, each session lasts 15 minutes – this cannot be changed. Some people are going to like this, others may find it slightly restrictive. If you’re one of those people who intends to use the machine for longer than 15 minutes at a time, you’re going to have to set the machine again – once the initial 15 minutes is up. You might find this 15 minute auto shut-off is a blessing in disguise, it will inevitably help some people avoid overusing the machine. Omron’s PM3031 comes with two pads, making it a single channel TENS unit. This type of machine can be used to treat one area at time. Unfortunately, there’s no way of adding more pads to the setup. If you want to treat more than one area at a time you’ll need a dual channel device, I would suggest taking a look at the Zewa SpaBuddy Sport or TENS 7000. A common complaint with Omron’s PM3030 is that it only has 5 intensity levels. It seems the designers at Omron took this into account when they designed the Pain Relief Pro. They doubled the number of intensity levels to 10. This gives you twice as much control over the strength of your treatment. The intensity can be increased and reduced by pressing the up and down arrow keys on the front of the device – it couldn’t be any simpler. Something worth noting with the Pain Relief Pro is that it’s not the most powerful device on the market, or at least it doesn’t feel like it is. 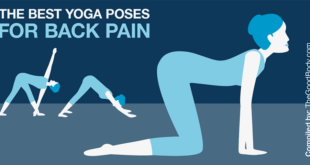 If it’s for chronic pain you may find it lacks a bit of power. 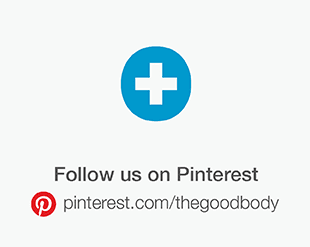 However, if you’re looking to treat minor aches and pains, it could be just the machine. One of the things I like best about the PM3031 is how Omron has managed to add more features and options, while retaining the simplicity of the PM3030. Not only that, they’ve managed to make it more user-friendly. If you’ve read my PM3030 review (it can be found here), you’ll know one of the major drawbacks is because the device doesn’t have a screen. Having no digital display may appeal to those who are technically challenged – but it can make some things more complicated. 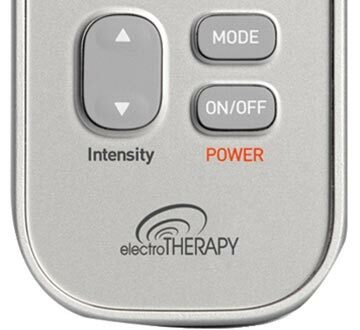 With the Pain Relief Pro you can see everything: how long is left, selected mode, battery level, intensity level and there’s even a pad icon as well. The pad icon is a smart addition to this model, it lets you know if there is any problem with the connection. When researching the previous Omron model I discovered some users weren’t connecting the wires properly to the device. For those in question, this was drastically reducing the performance (and power output) of the machine. 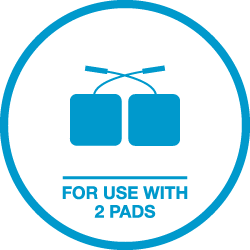 The great thing about the pad icon is it will tell you immediately if it’s not setup properly, helping ensure you are getting the maximum from the device. The only slight downside with the display is there’s no backlighting. 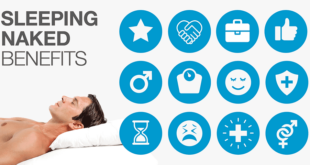 Maybe the next Omron TENS unit will have this feature! If a backlit display is at the top of your wish list, you could consider the AccuRelief Single Channel TENS Pain Relief System. It has a fairly similar feature set to the Pain Relief Pro and is priced slightly lower. In terms of the controls, there are only three buttons (if we include the up / down intensity arrows as one). The other two buttons are: ON/OFF and MODE. Operating the device is as easy as pie, all you have to do is switch it on, select a mode and then adjust the intensity to suit. That doesn’t sound so hard, does it? Omron does it again… Pain Relief Pro PM3031 is another Omron TENS machine that’s simple, straightforward and easy-to-operate. The last thing I want to cover in this section is to do with swapping modes. This machine has been designed so you can do that in the middle of a treatment. It’s a pretty nice feature. With most devices you’d have to stop the current session and start over again – that’s not the case with the Omron PM3031. Simply press the mode button until you select the one you want. It does take the intensity level back down to the lowest setting so you’ll need to adjust that to suit. Some users aren’t overly keen on it doing that, however, I believe it’s necessary. Each mode provides a particular sensation and some will feel a lot different to others. 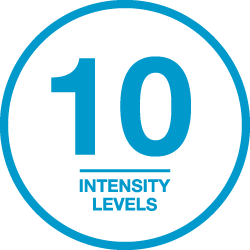 If you’re using one of the modes on intensity level 10 and then switch to another it may feel stronger or be faster. To avoid any unexpected surprises it’s better to start at a lower intensity, you can easily work your way up by pressing just one button (up). I’m sure that’s why Omron created it this way. If this is the case, the batteries will go further with this machine than PM3030 (Omron estimates they’ll last 3 months in that device, with the same daily usage). I think what’s important to realize here is that there are a number of factors that are going to affect battery life. Not everybody is going to get the same out of a set of batteries. Battery type / quality, the mode you use and what intensity you have set are all going to play a part in how long each set lasts. One thing I’m not massively keen on is access to the batteries. Omron recommends using a coin to twist open the battery cover. (I think you could also use a large flat head screwdriver in this case.) I would have preferred a better solution here, although, when it’s a device you like you can live with something small like this. How much juice is left in those batteries? Can you imagine coming home from work – only to discover there’s nothing left in you TENS unit’s batteries? With Omron’s Pain Relief Pro you’ll never find yourself in this predicament – due to the battery level indicator. It will display an icon when battery is close to low and then another when it is low, giving you plenty of time to source replacements. The battery icon is simple but incredibly useful. Usually you only find this type of thing on rechargeable devices. If you are going to be using the machine regularly, it would be prudent to buy a box of batteries. 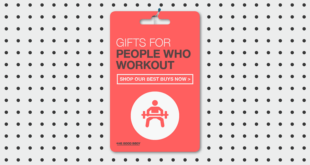 Not only will it work out cost-effective over time, it will save you having to keep buying them as you go along. Remember, Omron recommends high quality AAAs. This particular box of 24 looks like excellent value, as does this set of 34. Either of those two should do the job nicely and keep you going for sometime. The device measures 4.41 in (H) x 2.05 in (W) x 0.98 in (D). This makes it shorter than the iPhone 5 on the height and width measurements. Obviously it’s deeper than the iPhone 5, mainly because it has to house the batteries inside. In comparison to other popular TENS units, it’s a similar size to TENS 7000 – slightly taller – but a little narrower and about the same depth. It’s not as compact as Omron’s other machine, the PM3030 but is considerably smaller than the truMedic PL-009 (which is 7.8 in tall). 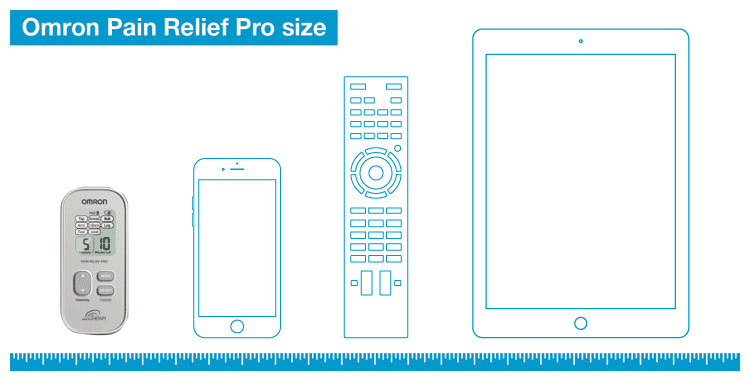 Pain Relief Pro isn’t the smallest or most compact device on the market but it certainly isn’t a big brick! Weighing 3.53 oz, there’s not too much to it – it’s nice and lightweight. In fact, you may be surprised to know it’s even lighter than the iPhone 5 (which weighs in at 3.95 oz). To put this into context, when compared to other TENS machines it seems reasonably light, both TENS 7000 and truMedic PL-009 weigh 5.29 oz. With its relatively small size and lightweight construction, Omron’s Pain Relief Pro can justifiably be categorized as a portable TENS unit. Something I’ve been calling for more TENS unit manufacturers to do is provide a carrying case with their machines. 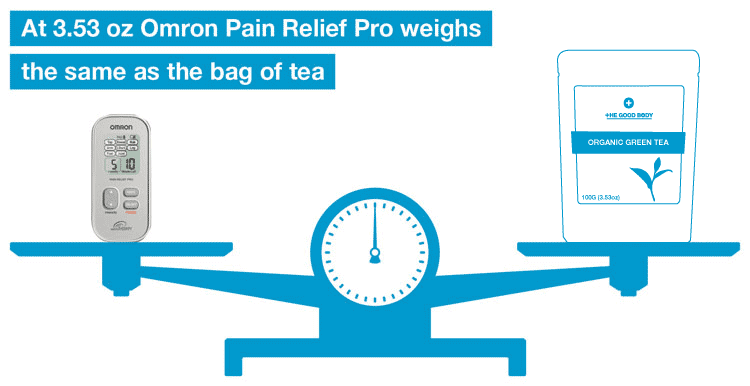 Omron has almost managed this with Pain Relief Pro… but not quite! They ship a soft carrying pouch with the device. It’s good that they actually give you somewhere to keep your unit and accessories (which is more than most do), however, it isn’t going to provide any protection. A case with a hardshell exterior like this doesn’t cost much at all on Amazon – and does a better job storing everything – plus it offers a good amount of protection. If you’re planning on taking your new machine on vacation or even to the office, you want something proper to carry it round in. Omron supplies exactly what you need to get started. When you open the box up you’ll find the PM3031 TENS unit, lead wires, 1 set of pads (2 in total), 1 set of batteries (2 x AAA), a pad holder, pouch and instructions, plus a quick start guide. There’s also a belt clip in there, which depending on how you use the device, can be very helpful. I’ve never bothered with a belt clip myself because I like to lie down and relax during a TENS session – but I know lots of you out there find them to be extremely useful. 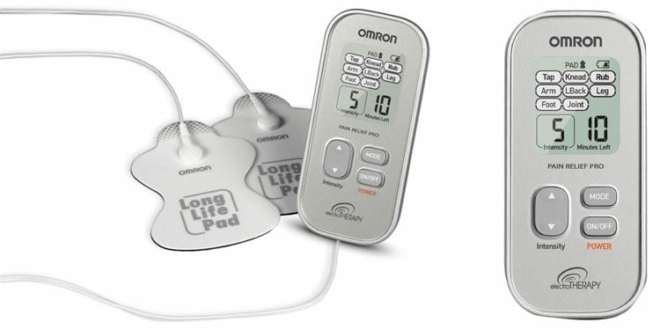 Omron Electrotherapy Pads: Before purchasing the Omron Pain Relief Pro – be aware you can only use Omron replacement pads with the device. The electrodes are not a universal fit. In terms of replacement pads, make sure you consider this thoroughly before deciding whether this machine is right for you. The only reason I say this is because they’re not the cheapest to replace, (you can check here for the most up-to-date price). Omron says each set can be used up to 150 times. I think if you can get that amount of use out of them, you’ll be doing very well. 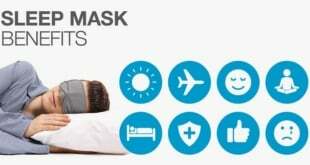 It’s probably worth reading the user reviews for those pads, most of them will be from people who use them on a regular basis and over a period of time. Another thing worth mentioning here is there’s an extra large set of pads you can buy – to use with this machine. 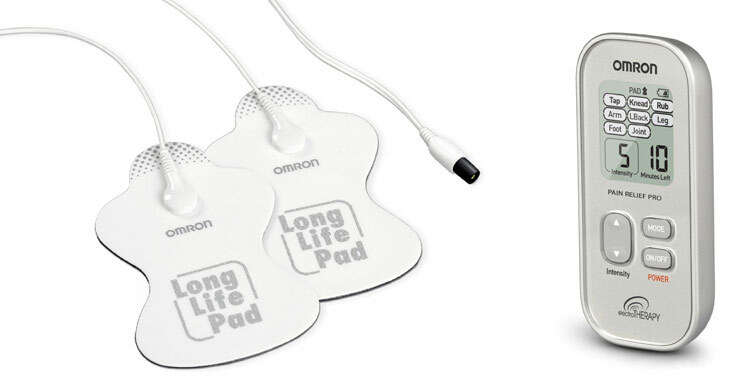 Omron has designed them to be more effective on larger pains, such as the back, hip and thigh. You may also like to consider Omron compatible pads, read here for further information. 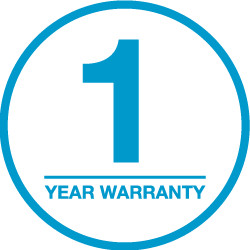 You get a 1 year limited warranty with the Pain Relief Pro. If you’ve read any of my other reviews you’ll know that’s about standard for TENS machines. A year is the same as you get with AccuRelief devices and is considerably more than the 90 days cover truMedic provides for its PL-009. There are some units out there that come with longer warranties. If the warranty is your top priority, you could consider something from this brand – their machines come with an attractive limited lifetime warranty. When I researched consumer reviews I found the Omron Electrotherapy Pain Relief Pro PM3031 to be a highly-rated TENS machine. I checked on 24 November, 2015 and on Amazon the device had been reviewed by more than 500 people. I found the product to be well priced on Amazon. Another big retailer stocking the machine is Walmart. Another thing I noticed is there was more than one listing on Amazon. You wouldn’t believe how much difference there was between them. When I think about the price of this machine, I believe it’s reasonable. It’s not the best value TENS unit on the market – but like with Omron’s other machine, the PM3030 – people opt for this device due to its simplicity. With Pain Relief Pro, the designers at Omron have addressed some of the drawbacks of its predecessor the PM3030. They have created another TENS unit that’s wonderfully simple and intuitive. 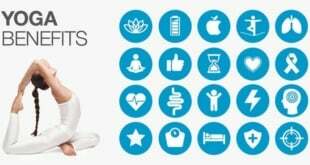 If it’s an upgrade from the PM3030 you’re going to love the new features and modes, they’ll enable you to add plenty of variety to your TENS treatments. 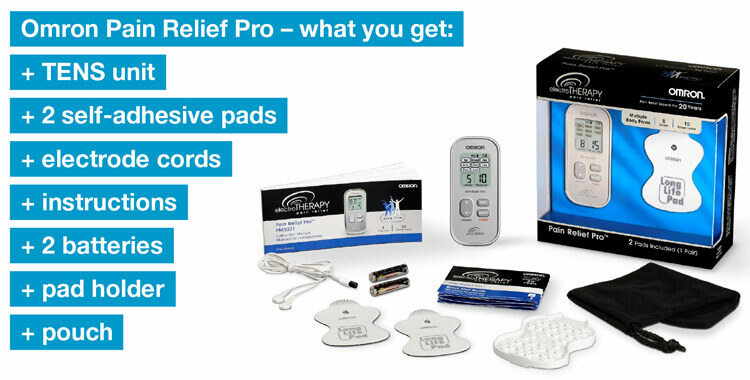 On the other hand, if you’re searching for an easy-to-use device or your first TENS unit, it might be worth taking a closer look at the Pain Relief Pro. If you liked the PM3030 you’re going to love Omron’s Pain Relief Pro PM3031. This uncomplicated device retains the simplicity of its predecessor, while boasting a wealth of impressive new features.